The P-NP problem is the most important open problem in computer science, if not all of mathematics. 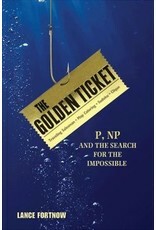 The Golden Ticket provides a nontechnical introduction to P-NP, its rich history, and its algorithmic implications for everything we do with computers and beyond. In this informative and entertaining book, Lance Fortnow traces how the problem arose during the Cold War on both sides of the Iron Curtain, and gives examples of the problem from a variety of disciplines, including economics, physics, and biology. He explores problems that capture the full difficulty of the P-NP dilemma, from discovering the shortest route through all the rides at Disney World to finding large groups of friends on Facebook. But difficulty also has its advantages. Hard problems allow us to safely conduct electronic commerce and maintain privacy in our online lives.